The inventor of a foldable bicycle helmet has won a £30,000 prize to take it towards commercialisation. The “EcoHelmet” is the brainchild of Isis Shiffer, a 28-year-old designer and bike enthusiast from New York who came up with the idea after she began using city bike-hire schemes but was worried about cycling without a helmet. “It just occured to me that there was an infrastructure gap here. We have these fantastic [bike-hire] schemes all around the world and if you want to wear a helmet you either have to bring your own or spend quite a bit of money,” Shiffer told the Guardian. 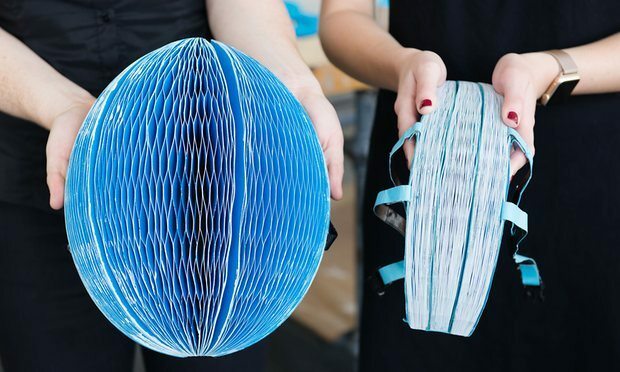 Her solution – the folding helmet, based on card – has been crowned the international winner of this year’s James Dyson award, having already won the national prize in the US. Across 22 countries, prizes are awarded to university-level designers and engineers for innovative solutions to conundrums, with previous winners of the international award including a robotic arm, fishing nets that do not trap endangered species, and an inflatable incubator for premature babies. 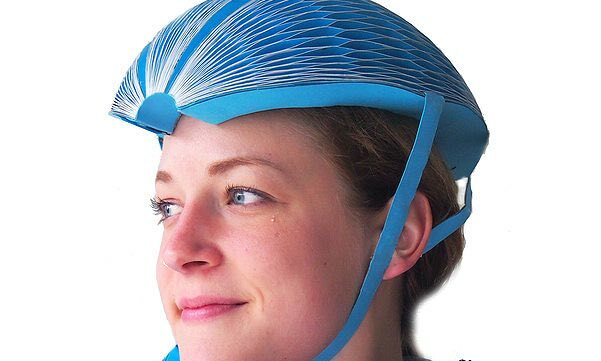 “EcoHelmet solves an obvious problem in an incredibly elegant way. 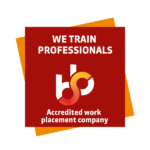 But its simplicity belies an impressive amount of research and development. I look forward to seeing EcoHelmets used in bike shares across the world,” said James Dyson. Resembling an accordion ball Christmas decoration, the helmet can be flattened, while a honeycomb structure, visible when unfurled, gives it strength. A recent graduate from the Pratt Design Institute in New York, Shiffer developed the EcoHelmet during her course, testing the design with crash apparatus during a stint at the Royal College of Art and Imperial College, London. While Shiffer is now running her own consultancy firm, she says she plans to develop the helmet further and has already teamed up with an LA-based company to tackle supply chain, marketing and fundraising aspects of the project. Shiffer says her plan is to coat the helmet with a recyclable or biodegradable waterproofing material, such as wax, for rainy days. It will also be kitted out with an indicator or mechanism to highlight when it should be ditched for recycling and replaced with a new helmet. The finished product is expected to cost about $5 (£4) per helmet and could be dispensed in vending machines at bike-hire points. She views the EcoHelmet as a step up from previous attempts to create sustainable helmets, such as the Kranium design by Royal College of Art student Anirudha Surabi, which was later taken up by cycling gear maker Abus. “[That] is polystyrene on the inside, cardboard in the middle and plastic on the outside, so it is not really in any way biodegradable or recyclable,” said Shiffer.